Bolillo rolls are the Mexican version of French rolls. They are crispy on the outside and super soft on the inside. 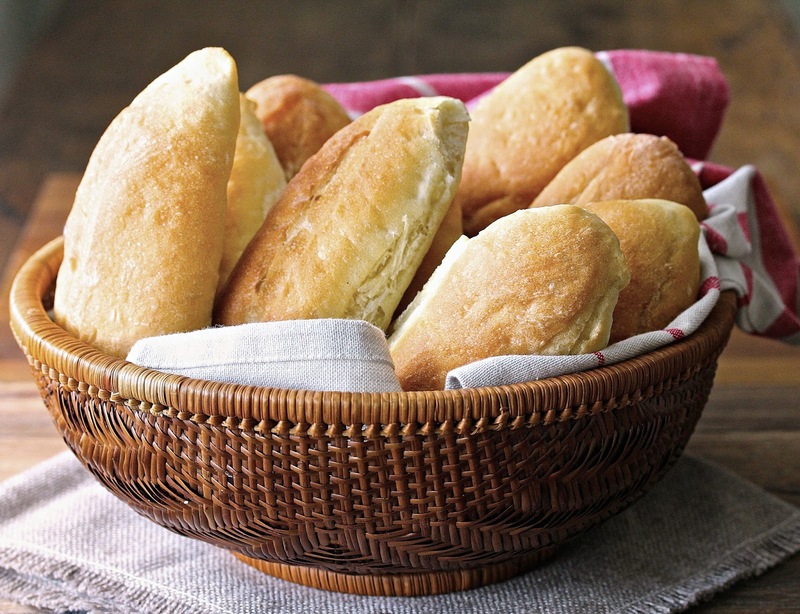 This bread is also known as pan Francés. 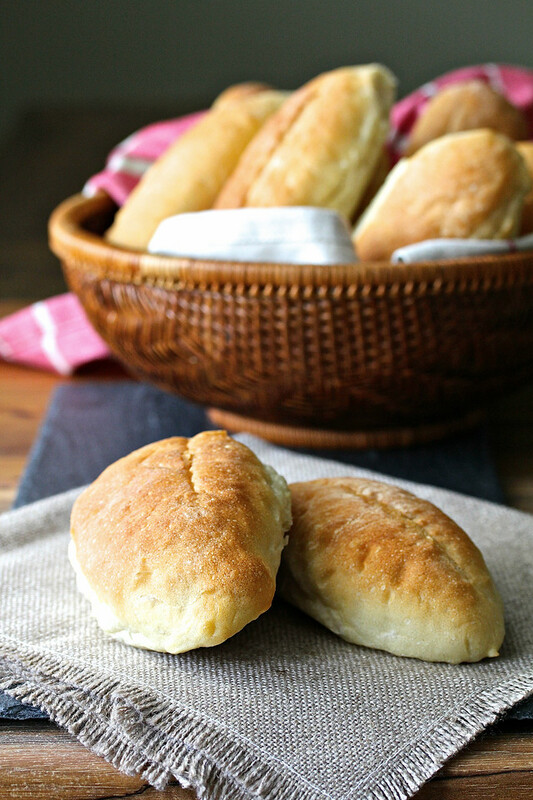 While the Spaniards introduced wheat to Mexico, I understand that these rolls were introduced by the French (maybe during the ill-fated reign of Maximilian), and are now one of the most popular breads used for Mexican sandwiches. They have a thin crispy crust on the outside and soft crumb on the inside. While I used lard (manteca) in the dough, you can substituted vegetable shortening or butter in the dough if you prefer, but if unless you are a vegetarian, I highly recommend going with lard. For one thing, they smell so good when they are baking. According to my colleagues who know authentic Mexican food way better than I do, one of the best ways to enjoy bolillos is to make molletes; tortas smeared with refried beans, salsa, and cheese, and then toasted.... and then served with even more salsa. These rolls are most crispy when fresh from the oven. The crust will eventually turn soft, but can be re-crisped in the oven. Just brush or spray them lightly with water, and then bake for a few minutes in a 350 F degree oven. These were taste tested by those who know better than I do as to their authenticity, and declared "sooooo good." That works for me. 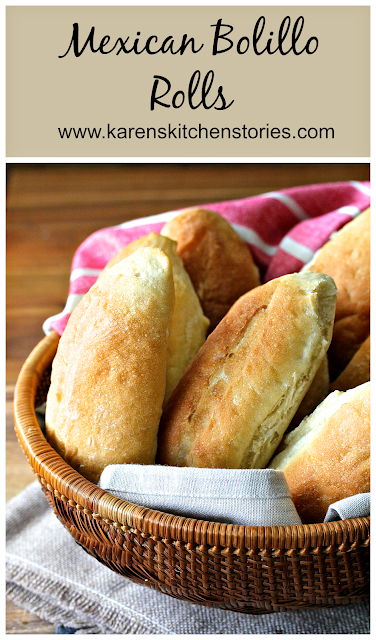 I've got two other Mexican yeasted bread recipes on the blog too. First, these cemita rolls from Puebla... and then these conchas, a favorite Mexican pan dulce, or sweet bread. While most of us who live north of the border aren't as familiar with the wide variety of delicious Mexican yeasted breads, they definitely are worth exploring. In the bowl of a stand mixer, mix all of the ingredients, minus 60 grams (1/2 cup) of flour for about three minutes. Check the dough by touching it lightly with your finger to see if it sticks. If it does, add flour, one tablespoon at a time, until the dough is soft but no longer sticky. Continue mixing for about 6 to 8 minutes on medium speed, until smooth. Cover and let rise for about an hour, until doubled. Deflate the dough and divide it into 6 to 10 equal pieces, depending on how large you'd like your rolls to be. I made 10 rolls, which are "mini" sized. Shape the dough into balls, cover with oiled plastic wrap, and let rest for five minutes. Shape the dough into an oblong, rolling both "sides" toward the center and then pinching the dough together to create seam. Roll the dough with your hands to taper the ends like a football. Place the shaped rolls, seam side down, on an oiled parchment lined baking sheet. Cover with oiled plastic wrap and let rise until almost doubled. In the meantime, preheat the oven to 400 degrees F.
When ready to bake, spray the tops of the rolls lightly with water, and slash the tops lengthwise with a lame or very sharp knife. Bake for about 22 minutes until golden. Cool on a wire rack. My folder is very thick with good intentions Sally! It might be very similar to the Brazilian bread, with just a different name.